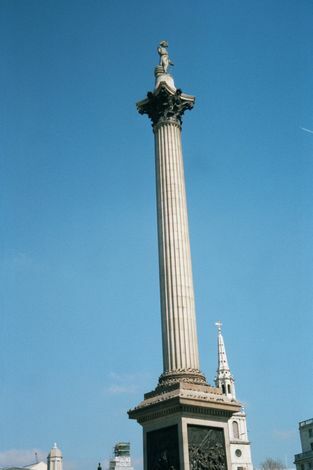 His fame down only a notch from royalty, Nelson's Column in Trafalgar Square is an enlarged copy by William Railton of the columns of the temple of Mars Ultor in Rome. Completed in 1843, the 98-foot shaft is made of Devon-granite blocks 10 feet in diameter. The reliefs on the base show the battles of St. Vincent, Copenhagen, and the Nile, as well as Nelson's death aboard the Victory.